It's a tradition in Greece to serve visitors with what is called a spoon sweet to accompany their coffee of tea. 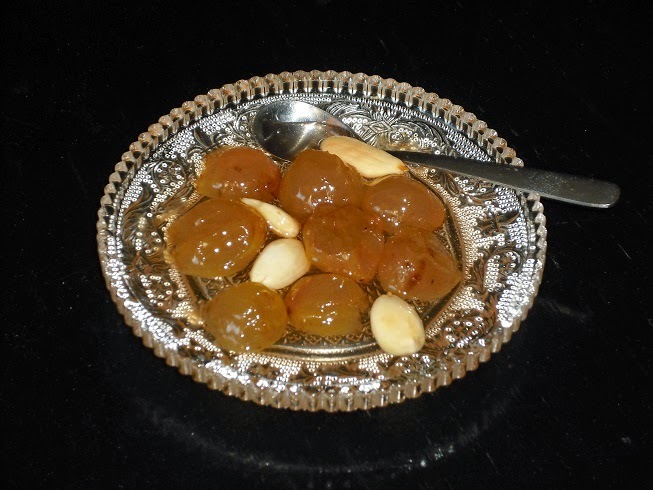 There are a variety of fruits that are used for this - this is an easy recipe for a grape sweet with almonds. We have previously posted recipes for Apple and Orange spoon sweets. Rinse the grapes well and put in a pan with the sugar and 50ml water. Bring to the boil and stir slowly so that all the sugar melts. Continue boiling for another 10 minutes. Remove from the heat, cover and leave for 24 hours. After the 24 hours, bring to the boil again and continue until it has a syrupy consistency. Add the almonds and lemon juice, mix them in and remove from the heat.